Blu and Jewel, the last pair of blue Spix's Macaws, plus their children and friends search for conspecifics in the Amazon, but cockatoo Nigel seeks revenge on them. Light, colorful animation fun from the makers of „Ice Age“, but it doesn't entertain the whole family. Not long ago the last blue Spix's Macaw Blu learned to fly in Rio and won the only female Jewel for himself. Now they have three chicks and their life is relaxed. The only problem seems to be that Nico and Pedro cannot find a talent for the carnival. But then Blu's former owners, Tulio and Linda, find signs of other living conspecifics of Blu and Jewel during their Amazon expedition. Therefore, Blu's family and their friends set out for the wilderness, where not only loggers, but also Blu's adversary, the cockatoo Nigel, with the poisonous frog Gabi wait for their arrival. "Rio" was so lukewarm that few have longed for a sequel, but successful enough at box offices worldwide to encourage the film team led by helmer Carlos Saldanha to make a sequel. Saldanha has enough experience with this, as he's also responsible for the "Ice Age" tetralogy. 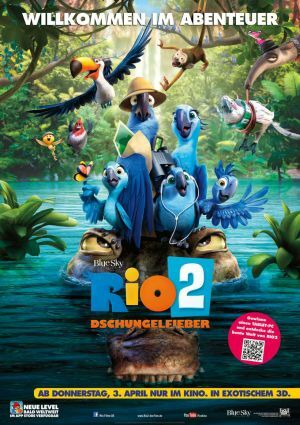 After the flying lessons of the first installment, "Rio 2" continues the story with all the known characters, but this time with more emphasis on family and the rescue of the Amazon rainforest. Like before in part 1, the colourful musical numbers might be the most entertaining for some, although the humour in "Rio 2" seems to work slightly better. But the flick goes through the family reunification with approved, clichéd formulas of initial rejection and subsequent probation of the son-in-law (much like "Meet the Fockers" and its likes). Most of the characters are stereotypical, if not arbitrary. This could just be exciting for children, but adults might get bored. While "Rio" subtly points to illegal trade of smuggled animals, the second installment now indicates more distinctly, but very superficially to the problem of illegal logging of primeval rainforests. The solution offered in the film fits the narrative, which relies on lightweight, colorful and volatile entertainment, but it doesn't seem to offer much educational value. Fans of "Rio", and those who are not as discerning as we critics, can hope to enjoy "Rio 2", too. The film is colorful, pretty to look at, musical and narrated at a good pace. But the impression remains that it could have been much better: more wit, more fun for everyone, more significance. My only joy was the poisonous Gabi and her dubbing voice (pitch-perfect: Kristin Chenoweth).